We hardy Midwesterners are accustomed to the wild mood swings of winter, so we know there’s no excuse to miss the best this season has to offer. Whether you enjoy relaxed pursuits or more active adventures, you’re sure to find a winter wonderland just outside your window. Weather-hardy Midwesterners are accustomed to winters with both freezing temperatures and balmy heat waves, snowdrifts several feet high and light dustings on the ground, and every mix of wintery slush in between. The unpredictability can make it difficult to get outside and enjoy the natural world. But opportunities await those who are ready to explore what nature has to offer, through both active pursuits and relaxed strolls. Whether you get outside with your kids, your four-legged friend, a loved one or just yourself, time away from electronics will never disappoint – and it could even release some stress. Here are some ideas for getting out and about this winter season. Area park districts, conservation districts and forest preserve districts constantly create new opportunities for fun – and learning. A new program series for preschool-age children through the Crystal Lake Park District Nature Center has quite a following. Nature Tots with Daisy is a 45-minute class that focuses on one aspect of nature, and it will continue throughout the winter, utilizing the indoors if necessary. Upcoming classes focus on the groundhog, caterpillars, creating Valentines from found and natural items, and using the imagination to see leprechauns and fairies. Getting the kids outside in the fresh air may be easier now that Hickory Knolls Discovery Center in St. Charles has a newly opened outdoor nature play area. Hickory Hideout, the culmination of a local Eagle Scout project, features large logs and boulders for kids to climb, as well as a paleontologist digging pit with sand and gravel, complete with shovels and trucks. “It has been played with in all kinds of weather and is accessible all year long,” says Laura McCoy, nature education supervisor at the discovery center, which is part of the St. Charles Park District. Hickory Hideout and the surrounding natural area are open dawn to dusk. If the mystique of visiting an off-limits natural area interests you, check out the McHenry County Conservation District’s “Sites Seldom Seen” program. While McHenry County Conservation District has 34 sites open to the public, it also maintains areas that are protected from the public because they house endangered species or don’t yet have trails, says Wendy Kummerer, director of marketing and communications. However, during Sites Seldom Seen, hikers can trek through wetlands and rough terrain that usually don’t see boot prints. Sites change every season. On Feb. 10, hikers will explore a portion of a conservation area in Greenwood that includes wooded areas, prairie and sections of Nippersink Creek. 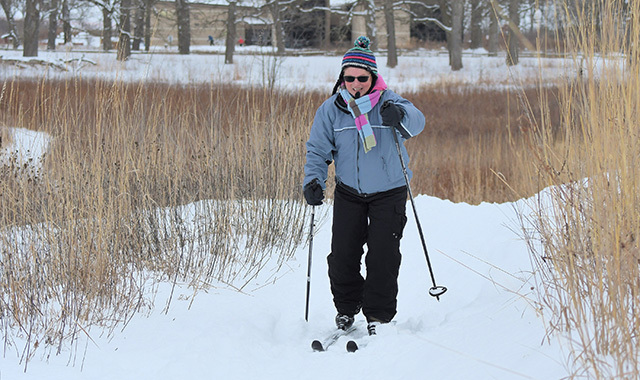 The Forest Preserve District of Kane County offers several educational programs that are sure to get your blood pumping this winter. “There’s a wonderful world of nature out there, and more and more studies are showing how important having that connection with nature is for our health – our physical health, our psychological health and you might say spiritual health as well,” says Valerie Blaine, environmental education manager. The monthly “By the Light of the Moon” program discusses the Native American legends of the moon with a night hike. On Feb. 20, learn about the Snow Moon at Camp Tomo Chi-Chi Knolls in Gilberts. “Trek With A Naturalist” is a monthly two-hour evening hike for active hikers. On Feb. 14, trekkers meet in Hannaford Woods Forest Preserve in Sugar Grove; on March 21, the group meets at Bowes Creek Woods Forest Preserve in Elgin. A special Groundhog Day Hike is scheduled for Feb. 2, outside the Creek Bend Nature Center in St. Charles. Similarly, an all-ages winter scavenger hunt will take place Feb. 17 at Creek Bend. A naturalist will guide the group on a hunt for winter things: a leaf chewed by an insect, an animal home in a log, a deer rubbing and more. Hickory Knolls Discovery Center also has various outdoor educational and physical activities for families. Happy Hikers meets all year long to hike the surrounding trails, and it’s usually led by naturalist Pam Otto. On Feb. 16, families can train to be a frog monitor. This citizen scientist opportunity teaches basic instructions of frog calls, and then invites people to head outside and collect data that will be used in scientific research. “Even when it’s really cold out, these cold-blooded animals are kind of waking up from hibernation,” says McCoy. Around here, we tend to enjoy having four seasons and seeing nature in winter, says John Nelson, director of operations and infrastructure for the Lake County Forest Preserve District. “Everything does look different; you can view farther with the leaves off the trees,” he says. “You can see cardinals, juncos and some of the birds that overwinter here. The great horned owls are out – that’s a great thing to hear at dawn and dusk. “Because it’s a little bit less busy in the preserves during the winter months, it is quieter, so many people enjoy the peace and solitude,” he adds. One way to enjoy the preserves is to join the Walk with a Naturalist event. This guided walk takes place the morning of Feb. 2 at Ray Lake in Wauconda. The Lake County Nature Network, a group that connects families with nature, hosts a kids’ “Playdate with Nature” on Feb. 7 at the Lakewood Winter Sports Area in Wauconda. Lakewood is a busy preserve for winter sports, with a giant sled hill, a mile-long, solar-lit hiking/cross-country skiing trail and ice skating options all in one area. The forest preserve district also maintains paved walking areas at Hastings Lake in Lindenhurst as well as Independence Grove and Old School in Libertyville. Winter weather can be fickle, so McHenry County Conservation District (MCCD) has come up with a cool idea to take advantage of fresh snow. Seize The Day is a free call list that gives more than 150 followers 24-hour notice to attend a fun, last-minute snow activity. “With 24-hour notice, let’s go have some good old-fashioned family fun – for free – with an education leader while sledding, ice fishing, snowshoeing, or just spending a day tracking and hiking in the woods,” says Kummerer. Whether or not there’s snow, you can still join Candlelight Night Skis on groomed trails. Each month, more than 100 people descend upon a different designated preserve in McHenry County. The February location is Prairieview Education Center in Crystal Lake, with trails open Feb. 15 and 16. MCCD encourages patrons to engage in do-it-yourself adventures, which is why they offer family exploration packs at the Lost Valley Visitor Center, located inside Glacial Park in Ringwood. “Glacial Park is considered the jewel of McHenry County,” Kummerer says. “It is 3,300 acres of wide-open spaces with the woodlands, the wetlands, the streams. But for winter activities, anything you can do outdoors you can do at Glacial Park.” And when you’re all done outside, come inside for puzzles and other activities. Three unique winter events have taken place in Crystal Lake for decades, and they draw as many spectators as participants. For more than 20 years, diehard softball players in Crystal Lake have played in the 16-inch Snowbird Softball Tournament, happening this year on Feb. 2 in Lippold Park. The Crystal Lake Anglers Club used to host a popular fishing derby at West Beach on Crystal Lake, but after the club disbanded, no derby took place last year. “There was a big public outcry, ‘Where’s the derby?’” Leech says. This year, the Crystal Lake Park District Nature Center resurrects the ice fishing derby on Feb. 10. Following tradition, part of the proceeds will help restock Crystal Lake. Competitions, raffles, prize categories and more will be part of the event. Finally, the Chili Open Golf Classic, which began in the 1960s, takes place Feb. 9. Two 9-hole, 32-par courses will be created on the ice of Crystal Lake with old Christmas trees providing obstacles. If the weather is still too much to handle, there’s still a way to get your outdoors fix while engaging with conservation. The Colonel Palmer House in Crystal Lake houses the archives of the Crystal Lake Historical Society but it also offers a few winter Lunch and Learn programs. Feb. 1, museum patrons can learn how to set up gardens to attract butterflies and other pollinators, and March 1, beekeeper Willie Pilipauskas of Willies Honey Co., of McHenry, will explain beekeeping and demonstrate how honey is harvested. The Dunn Museum in Libertyville offers patrons a unique way to connect with nature and learn about the county’s history, with exhibits such as a life-size, 20-foot-long Dryptosaurus dinosaur, who roamed Lake County millions of years ago. The museum is part of a relocation/repurpose/expansion of the former Lake County Discovery Museum, which operated at the Lakewood Forest Preserve near Wauconda for 40 years. The Dunn Museum opened a year ago. Hickory Knolls Discovery Center features a small indoor play area, a child-size log cabin and a rotation of toys. It’s also a host site of the endangered Blanding’s Turtle as well as other reptiles and amphibians, plus Peter Rabbit. “Wild Wednesdays” at Hickory Knolls Discovery Center is an indoor, 45-minute program geared toward 1 to 5-year-olds, but patrons are encouraged to go out for a hike afterward. Each month has a different theme: February’s program focuses on recycling activities; March features snippets of Dr. Seuss stories with activities. This entry was posted on Tuesday, January 29th, 2019 at 12:00 pm	and is filed under Features, Top Posts. You can follow any responses to this entry through the RSS 2.0 feed. Both comments and pings are currently closed.